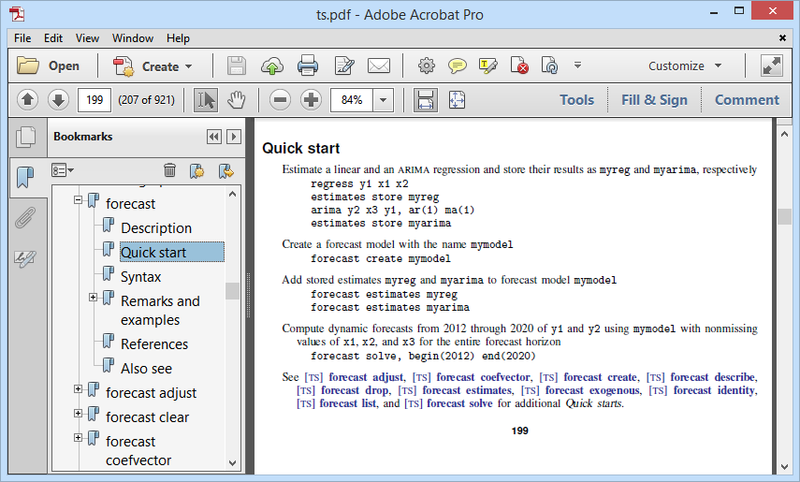 Quick starts were introduced in Stata 14. See the latest version of quick starts. 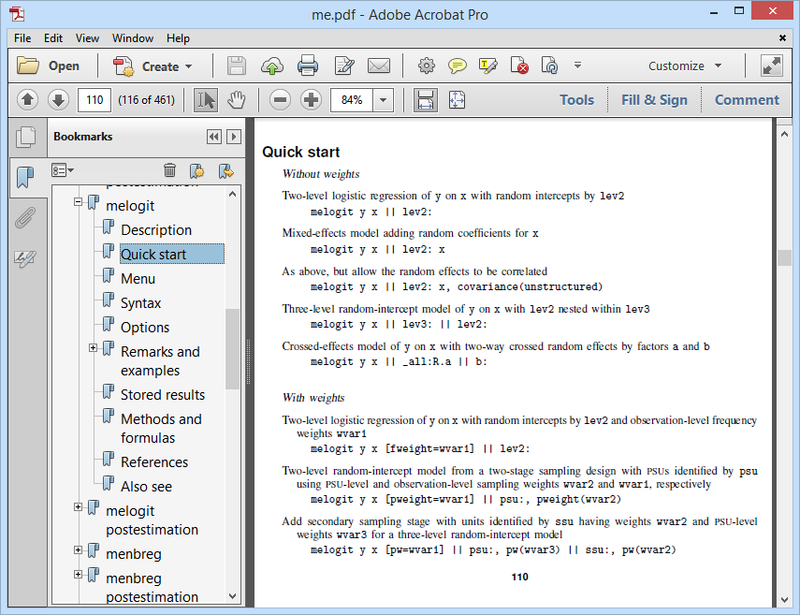 See all of Stata's documentation. 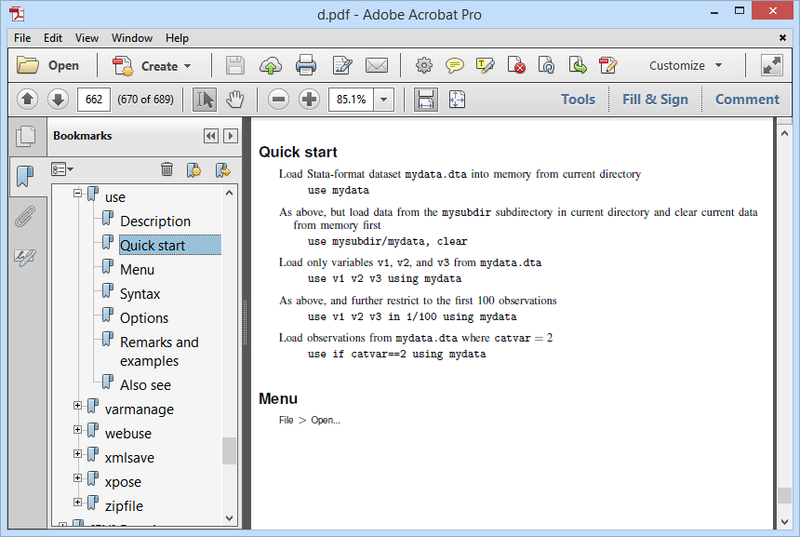 Quick starts are examples of the usage of each Stata command. 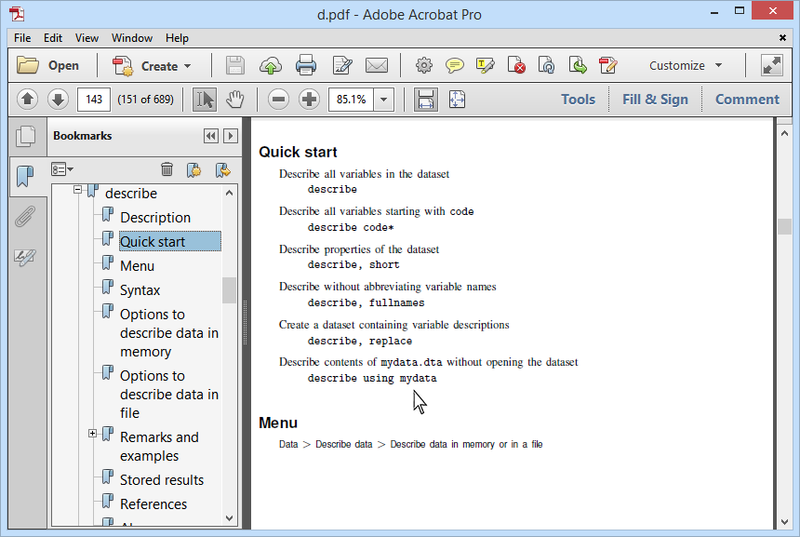 They appear at the beginning of the documentation for each command in Stata's PDF documentation. Take the simple, but fundamental, command use. Most work in Stata begins with use. Let's take a look at the Quick start. Even if you are new to Stata, the first 2 examples here probably are not much of a surprise. The poor use command is so basic, though, that its manual entry doesn't get many visitors. So, long-time Stata users might not know about the last 3 examples. Loading only the variables that you need will save memory and can speed your Stata up, and using a subset of observations is handy if you want to test commands or avoid typing if over and over again. But, how do you remember what your variables are called? We are glad you asked. The Quick start is also useful if you just want a fast reference for what options you need to combine to, for example, conduct different tests. 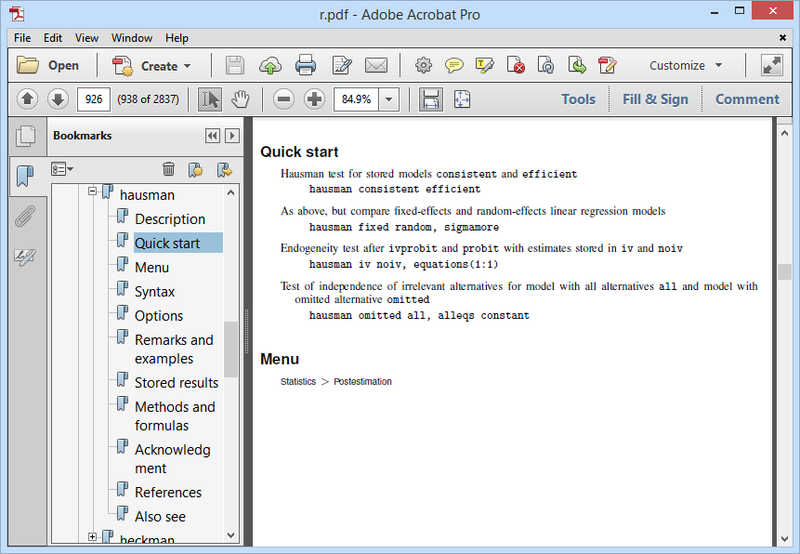 Stata's hausman is used to conduct far more than just the classic Hausman specification test. You can test whether a random-effects specification of your model is appropriate, conduct a test for endogeneity, and conduct a test of the independence of irrelevant alternatives (IIA) assumption. All of these require different options. How are you to keep up with them? Well, now you don't have to. They are conveniently located right at the top of the manual entry. The Quick start is also helpful when a command has a really complex syntax diagram. For example, take melogit. The list of options runs for a page and a half after this! It's not that the documentation is intentionally obfuscated, it is just that there are a lot of things one might wish to do with a command that fits multilevel mixed-effects logistic regression. Here, the Quick start shows how to fit common models. Oh, and did you notice the section on weights? Those are new. Check it out. Finally, for some entries, the Quick start gives you advice on the order in which you use commands. Suppose we want to create a forecast. We have read the documentation in [TS] forecast before. But, it has been a while and we just want a quick refresher on the commands we need. Of course, the forecast suite of commands is far more extensive than what's shown here, but the Quick start pares the process down to the essentials. If you have a favorite command, or one that you are continuously returning to the help for, we encourage you to check out its Quick start.